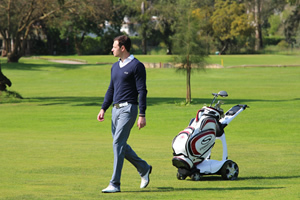 Stewart Golf is now offering a 'Signature' range of colour options for their powered machines. This custom colour allows your X9 Follow to stand out from the crowd. The colour will be applied by hand in the UK, to create a stunning and unique pattern. Note that although every effort will be made to produce the exact machine that you have specified, please be aware that exact colour or pattern matches cannot be guaranteed. The nature of the process & shape of Stewart Golf products means that there may be small discrepancies in alignment and the 'stretch' of the patterned material that is being applied. The X9 Follow is the latest generation of the multi-award winning X-Series from Stewart Golf which you can now have in the finish of your choice. Originally launched in 2003 as the X1 Remote, the X-Series is recognized as one of the worlds finest remote controlled machines. The X9 Follow is specifically designed as a Follow golf trolley, but as well as its “Follow” mode, the X9 Follow also comes with full remote control functionality that existing customers will be familiar with.